Now that we’re a day into 2014, it’s already time to start thinking about your elite status strategy and how to achieve your goals. While elite status qualification with hotels and airlines has for the most part remained the same, two of the major US legacy carriers – Delta and United – have both implemented new revenue requirements for their elite status programs, so in addition to planning out your flying in terms of miles and/or segments, elite flyers on both airlines will now have to factor in their spending habits as well. Here’s what you need to know. So depending on the status level you’re going for, you will now need to spend anywhere from $2,500-$12,500 to qualify. The MQD’s you spend on your tickets will appear in your account tracker after you actually fly. Your total spend across all Delta SkyMiles credit cards that are linked to the same SkyMiles number will be combined and count toward your annual total of eligible purchases and the $25,000 spending requirement. If you don’t have a Delta Amex card, or you don’t put $25,000 in annual spend on it, here’s what you need to know about Medallion Qualifying Dollars. If you achieve one Medallion qualification criteria and not the other, your status will be determined based on the lower of the two qualification thresholds that you achieved. For example, if you fly 76,000 MQMs but only spend $6,000 MQD’s, then you will earn Gold Medallion status instead of Platinum Medallion. Rollover MQMs will be calculated as anything in excess of the MQM threshold for the status earned based on the new criteria. In the above example, you would roll over 26,000 MQMs and would then need at least $2,500 MQDs (or the MQD Waiver) to earn Silver Medallion status the following year. You can keep track of your MQD’s by logging into your account on Delta.com. 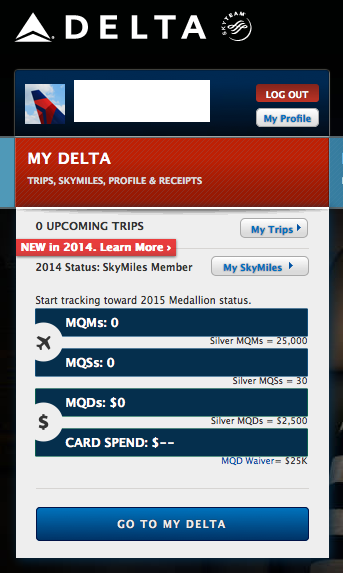 If you log into your Delta account, you can now view your 2013 Medallion Qualifying Dollars on your Account Activity page and My SkyMiles page at delta.com. You can keep track of your MQD’s along with your miles and segments on Delta.com. 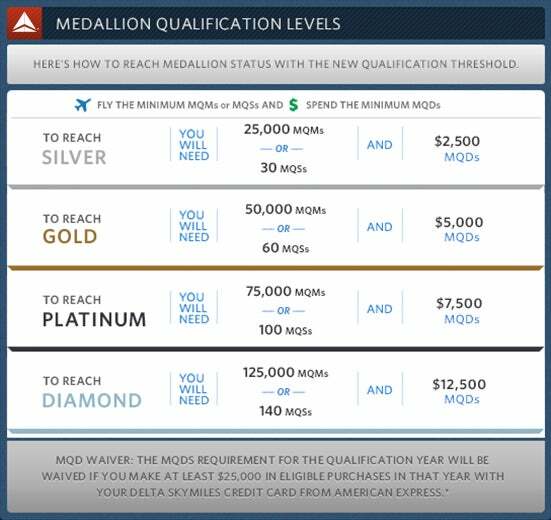 Medallion Qualification Dollars are the sum total of the SkyMiles member’s spending on Delta-marketed flights (flight numbers that include the “DL” airline code), inclusive of the base fare and applicable surcharges, but exclusive of government-imposed taxes and fees. Certain specialty tickets, including but not limited to unpublished, consolidator, group/tour, and opaque fare products will not count toward MQD. MQDs (similar to MQMs and MQSs) are earned by the member who is flying (whose name and SkyMiles number are listed on the ticket). This means that even if your company (or spouse, parent, etc.) purchases your ticket, the member who is flying will earn the MQDs. When it comes to booking through online travel agencies (OTA’s) such as Expedia, Orbitz, etc, if you are purchasing just the airfare – meaning it’s not a bundled vacation package with other components like hotel or car rental – then these are considered “published” fares so they count. Keep in mind though it may be possible to book an unpublished fare when using an OTA, and if that’s the case it would not count for MQD’s, so just be careful and verify the fare class of your ticket and that it has a Delta ticket number. Ancillary purchases or fees including checked baggage fees, priority boarding, Delta Sky Club memberships, Wi-Fi passes, unaccompanied minor fees, pet travel fees, mileage booster, ticket change fees, direct ticketing charge, same day confirmed fee, and standby upgrades purchased at the gate, do not count toward earning MQDs. Economy Comfort and Preferred Seating purchases ticketed through Delta do count towards earning MQDs. Flight spend for travel on other airlines ticketed through a Delta channel (featuring a ticket number beginning with “006”) will also be included in MQD’s. The vast majority of partner airlines flights are available through Delta.com as a codeshare. However, for partner flights that are not available on delta.com if you want the fares to count towards your MQD’s, you must call up Delta to book them. Once you call to book them, you’ll see them show up in your delta.com account. So even though this isn’t a Delta codeshare, since it is booked through a Delta booking channel it would count toward the Medallion Qualifying Dollars. Those huge fees on some international tickets – especially those to London and Paris – will count towards MQD’s according to Delta’s definitions of taxes versus carrier-imposed fees. Luckily, carrier-imposed fees count towards MQD’s. 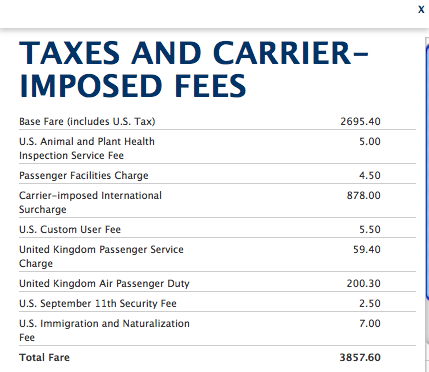 As you can see on the fare breakdown for this business class ticket from New York to London, the majority of surcharges are carrier-imposed – but you’re still missing out earning MQD’s on about $275 of other taxes and fees. Then in June, United announced that it would be implementing its own set of revenue requirements for elite status called Premier Qualifying Dollars that work pretty much like Delta’s. A minimum of at least four paid flights operated by United, United Express, or Copa Airlines will be needed to qualify for any Premier status. 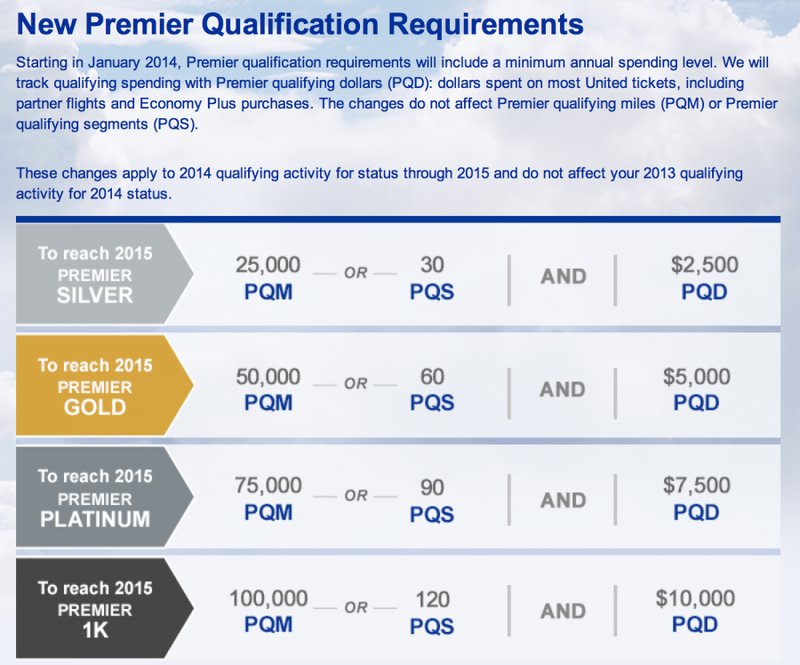 In 2014, the PQD requirement is waived for Premier Silver, Premier Gold, and Premier Platinum qualification for members whose address with MileagePlus is within the 50 United States or the District of Columbia and who spend at least $25,000 in net purchases in 2014 on a MileagePlus co-branded credit card issued by Chase. However, note that there is no PQD waiver for Premier 1K qualification. You will earn PQD for the base fare and carrier-imposed surcharges on qualifying tickets. Certain specialty tickets, including but not limited to unpublished, consolidator, group/tour, and opaque fares do not earn PQD. Government-imposed taxes, fees, and charges are not eligible for Premier qualifying dollars (PQD). Most of United’s partner airlines flights are available through United as a codeshare, so that makes it easier to confirm that they count toward your spending threshold. If you know you’ll be taking a flight on a Star Alliance partner that should be bookable through United but cannot get the flight to show on United.com, you can always try calling up the airline directly and booking the flight that way so that your airfare counts towards your PQD spending. In terms of non-airline fees and taxes, such charges are usually low on United tickets, so in most cases the portion of your fare that doesn’t count towards PQD spending should be just a small part of the overall price. Economy Plus purchases earn MQD’s. The only non-ticket purchases that earn Premier qualifying dollars (PQD) in 2014 are Economy Plus purchases. Baggage fees, United Club membership fees, change and cancellation fees will not apply. Also, like Premier-qualifying miles and segments, PQD’s will be credited to the member who travels, not the person who purchases the ticket if you buy the ticket for someone else. United PQD’s count towards the year in which you take the flight. If you booked a PQD eligible ticket in 2013 with a departure date in 2014, you will earn PQDs towards 2014 qualification upon completing each flight segment. It’s the same way miles and segments towards elite status are earned. So even if you already bought a ticket in 2013 for travel in 2014, you’ll get spending credit on them just as you would get mileage and segment credit in the year in which you actually fly. Although the easiest way to ensure that your spending on Delta or United count toward their revenue requirements, one reason you might want to book through an online travel agency as opposed to directly with United or Delta is that it might be possible to triple dip on points earning by going through the Ultimate Rewards shopping portal, earning loyalty program credits with an online travel agency, and still having your spend count with the airline. For example, Expedia, Hotwire, Orbitz, Priceline and Travelocity are all clickable for bonuses through the Sapphire Preferred Ultimate Rewards site. Sapphire Preferred cardholders can earn an extra point on any of them in addition to the points you would normally earn with the Ultimate Rewards card you carry. So if you used your Sapphire Preferred to book a ticket, you’d earn 3.21X points per dollar thanks to the card’s 2X category spending bonus on travel and the 7% annual points dividend, – which you can transfer at a 1:1 ratio to United miles – over the 2 United miles per $1 you’d earn by booking United flights with the United MileagePlus Explorer Card (and just 1.5 miles per dollar with the United MileagePlus Club card) or the 2 Delta miles per $1 by using a Delta Amex. In addition, Expedia offers their own loyalty program called Expedia Rewards where you can earn bonus points for flight purchases, which can then be redeemed for money off a future flight. 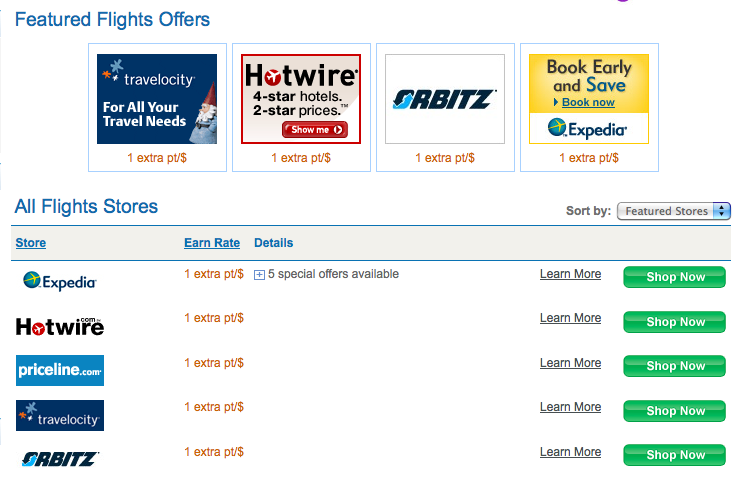 Orbitz also offers Orbitz Rewards, which you’ll earn “Orbucks” that can be used towards future flights. So in the case of Orbitz and Expedia, you would be triple dipping since you would earn Ultimate Rewards points for booking through their shopping portal, Expedia or Orbitz Rewards for booking from them, and United or Delta miles for the actual flight.